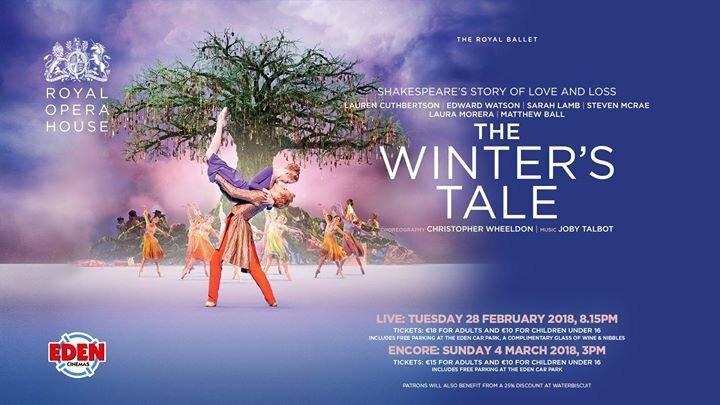 Take a voyage to Bohemia with The Royal Ballet this February with Christopher Wheeldon’s production of The Winter’s Tale, live at Eden Cinemas on Wednesday 28 February at 8.15pm, followed by an encore show on Sunday 4th March at 3pm. Wheeldon’s adaptation of William Shakespeare’s play features British Principals Lauren Cuthbertson and Edward Watson dancing the parts of Hermione and King Leontes, with Sarah Lamb and Steven McRae returning to the roles of Perdita and Florizel. With designs by Bob Crowley, this production distils the essence of Shakespeare’s dramatic narrative, contrasting the stark, brooding atmosphere of King Leontes’ Sicilian court with the vivid colour and pastoral charm of Bohemia. Complete with colourful costumes and mesmerising stage effects, Wheeldon’s production is widely acclaimed as a modern classic, tracing an emotive journey of redemption and reconciliation as a compelling dance-drama. Set to Joby Talbot’s eclectic score, The Winter’s Tale was created for The Royal Ballet in 2014, revived in 2016 and performed in Brisbane as part of the annual international tour in 2017. Nominated for an Olivier Award for Outstanding Achievement in Dance, the production won the 2014 Critics’ Circle National Dance Award for Best Classical Choreography. Tickets are available at €18 for adults and €10 for children under 16. This includes a complimentary glass of wine, free parking at the Eden Leisure Car park and 25% discount at Waterbiscuit. For those unable to attend the live show, an encore screening will be held on Sunday 8th October at 3pm. Tickets are priced at €15 for adults and €10 for children, including free parking and 25% discount at Waterbiscuit. The event is sponsored by Vivian Corporation, Villa Sandi, Encore magazine, The Malta Arts Council and Waterbiscuit. The next production in the 2017/18 ROH Live Cinema Season is The Royal Ballet’s Bernstein Centenary Triple Bill, featuring new work by Wayne McGregor and Christopher Wheeldon, alongside Liam Scarlett’s The Age of Anxiety on Tuesday 27 March at 8.15pm.